According to a poll conducted by Spanish newspaper AS, 86% of Real Madrid fans want to see David de Gea at the Bernabeu for the 2016-17 season and only 14% want him this season at the club. De Gea emerged as Real Madrid’s first choice target in the summer, but Los Blancos aren’t prepared to pay €40m for the 24-year-old world class goal keeper, who has only a year remaining on his contract. At the same time, United are determined not to lower the price for the Spaniard, who was voted as United’s player of the year last season. To be fair, the Old Trafford club have every right to demand a high transfer fee for their best player. The constant tussle between the two clubs has left De Gea’s future in limbo. While he has maintained a good professional attitude by not demanding a transfer move, but at the same time he is getting mentally restless by seeing his chances of moving to Madrid getting slim with every passing day. The Spaniard was dropped from Manchester United’s opening match against Tottenham last Saturday, and that is the best the club could do for him in this situation. In another article by the same publication, the paper notes relaying information from BBC, that De Gea’s move to Madrid will be delayed for a year, but the player still believes a deal could be reached before the closing of the transfer window. The Manchester United goal keeper was included in the club’s Champions League qualifier squad, but even if he plays against Club Brugge, he is still eligible to play in Europe for Madrid if the transfer goes through. The only clause – Madrid will have to pay €40m or else can forget about the move. Rafael Benitez insisted that he is happy with the goal keeping options Madrid have at the moment. As we can see from the poll, Madrid fans also believe that paying huge money for De Gea now doesn’t make enough sense. Real Madrid play a very ‘lopsided’ game when dealing with transfers. They insist on ‘top dollar’ when a club wants 1 of their players but flatly refuse to meet the asking price when they want someone elses! Good business maybe but fair? De Gea is worth all of the €40M being asked and if Real are not prepared to pay then he stays at United! United in the meantime should persist with offering him a new contract OR leave him to play with the under 21’s! 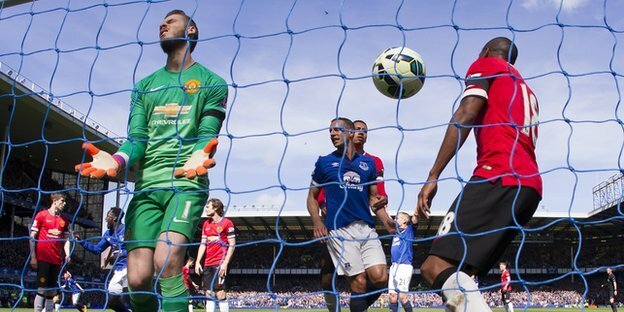 De Gea owes United and the stand-off is doing neither him or United any favours! Well said, and it is important for future dealings with clubs to know United are no pushovers. Bids unsettle players, so standing firm now may prevent silly bids being submitted for our top players and clubs no only a big offer will be considered. Also players mentality will already know that they will have play under their contract unless United want to sell and so won’t be thinking about moving as much. However, United do the same tactics. Who knows if United had submitted a proper bid close to Madrids asking price of £60m back in June when Ramos wanted to leave, would he be at the club now. Why haven’t United now just paid the release clause of Pedro and Otemendi already? They are not expensive considering that the transfer budget is between £150-£200m and with the money made from the out goings espec Di Maria, United have spent just around £40m. Spending £57m on these 2 would be very wise as they are world class, available and want United. If United continue to dither to get a better deal, they will end up at a premier league rivals. With holes in all the other clubs, the premier league is for the taking, and for United to do it, these 2 are a must! I wander why Real are so adamant of letting 1 of their best player to another club but willing to collect another clubs best player, I’m submitting that if they’re not ready to meet up the asking price of our De-Gea let them forget about him as in their own style, then we have David De-Gea sign a new contract failure to accept we demote him to play with U-21 after all Sergio Romero is doing well.